There are so many wonderful ways of self- discovery , and therefore empowering ourselves. One of the things I have enjoyed learning, practicing, and teaching over the years, has been numerology. It is not astrology, and has nothing to do with the planets’ positions, or our time and place of birth. Most importantly, it is not “psychic mumbo jumbo” or in any way ‘woo-woo’. 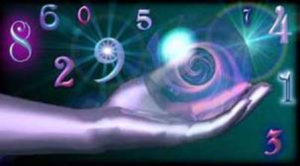 It is an exact science, born in ancient Greece at the time of Pythagoras, and it is Pythagorean Numerology that FeatherTouch Path & Purpose Charting is based upon. By exploring the fundamentals of form and frequency, he discovered relationships between mind and matter where before no such order had appeared to exist, and he pointed to hidden numerical patterns that served as keys for unlocking secrets of our psyches. The physical body in its healthy state has a specific rate of vibration, keeping us in balance with all of nature. Over 20 years ago, when I first began practicing this art, the human body in its healthiest state calibrated at 43 Hz, along with nature. Most did not calibrate that high, thus illness and dysfunction on many levels…. Interestingly, at this time, in our healthiest state, we calibrate at 73 Hz. We are indeed evolving at an extremely rapid state. This rapid state of evolution can feel chaotic to many, especially at this time. Numerology can help us to sort out what is happening, and how best to deal with what is happening. The one thing we all have in common is an in-bred desire for meaning, purpose, and direction. This deep desire to understand our life purpose seems as important to our spiritual and psychological well-being, as food, exercise, and human interaction are to our physical well-being. Although many of us don’t consciously recognize or acknowledge that we even have a specific life “path and purpose”, our subconscious knows what we are here to do. It therefore reaches out to us, sending messages through our dreams, intuitions, and innermost longings. Often, until we recognize and live in accordance with our underlying purpose, our lives may feel like puzzles with missing pieces. A FeatherTouch Path and Purpose Chart, always with a little input from the angels, helps to uncover many of those missing pieces. Contact us to learn more or to receive your own Path & Purpose reading.